There are 2 types of serve (or service) in table tennis: set-up serve and trick serves. 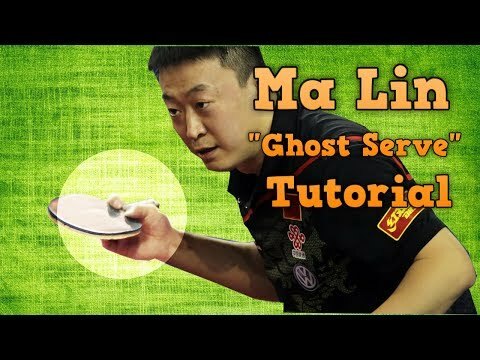 Today, I explain the best tips to perform the “ghost” serve of Ma Lin. Ghost serve is a tricky serve with a lot of underspin. If you don’t know how to return this tricky serve, the ball will go directly to the net. You should know how to serve short with sidespin in table tennis. In this article, you will learn step by step the advanced techniques to increase spin and deception in your serve. By watching the slow motion, you will also understand the key points to master the serve technique in table tennis. Why you should practice “ghost serve”? Where to contact the ball? How to control the direction of your serve? How to increase the spin in your tricky serve? How to return “Ghost Serve”? “Ghost serve” is a “tricky serve”, short but loaded with heavy underspin. This serve is the table tennis backspin serve, trademark of Ma Lin. The ball makes 3 to 4 bounces on the opposite side and can bounce back to the net. “Ghost serve” is the well-known serve of Ma Lin because he has the greatest touch in the China National Team. Penholder has also the advantages over a shakehand player because of more freedom in the wrist movement. The way that penholder holds his racket allows him to freely use the wrist. Between the tricky ace serve and set-up serve, Chinese players focus more on set-up serve because at the high level, you can’t win the game by just using ace serve. With Liu Guoliang, Ma Lin is the best server in China Team. He used a lot of fake motion after the serve, that’s why his serve is so tricky. So when people talk about Ma Lin, they think of his serve. If we talk about Wang Hao, we think of his beautiful reverse backhand. For Zhang Jike, it’s his solid physical strength and the “explosiveness”. For Ma Long, it’s his super consistent and powerful forehand. So every player has his own specialty. It’s because of their “micro-adjustment”. If you don’t know what “micro-adjustment” is, look above for my explication. and learn how to impact the spin into your serve. Using these 3 tips, you will know how and when to accelerate the ball to make this serve trickier. First, to do this “ghost serve” effectively, or another serves in general, you should hold your racket loosely. Put your thumb higher on the rubber, hold at the side of the blade and vertical (like the penhold). Holding the racket like this will increase the freedom of the wrist. This is crucial because you want to accelerate and spin the ball with your wrist. Second point. This point is very important. Put your elbow close to your body. To serve effectively, you need a quick acceleration, and short movement (explosiveness). Unlike another stroke (like forehand loop) which require a long and full movement, a good serve requires a short but quick movement. So you don’t need to use forearm here. Put the elbow close to the body to stabilize the shot. Amateur players don’t know this important point, so they can’t accelerate into the ball correctly. And my 3rd tip is: To make this serve tricky, add “fake motion”. That means after you contact the ball, move your hand up like you are making a topspin serve. Ma Lin always does fake motion after the contact point. Please remember: Don’t use the forearm. Fix the elbow and the forearm. The contact point is very close to your body. The closer you contact the ball, the easier you control it. New players tend to contact the ball too far from the body, and then there is not enough spin in their serve. The two rotation axis are: first your body. You must rotate your body to add spin, and power to the ball. Rotation of the body also controls the trajectory of the serve. To serve short, rotate your body a little. If you want your serve longer, rotate more. To serve to the right side of the opponent, rotate your body a semi-circle. To send the ball to the left side, rotate a full circle. Please remember: Don’t use the forearm. Fix the elbow and the forearm. It’s your body rotation that controls the length and the direction of your serve. This is the key point of a good server. Because with a little change (rotate more or less), you can suddenly change the direction of your serve. Surprise factor, and quality factor. More spin, more deceptive your table tennis serve. Body rotation is the first rotation axis. The second is your wrist. The wrist is where you accelerate and make the ball spin. Wrist movement is very fast. Without wrist, you can’t make a spinny serve. Again, don’t snap with your forearm around the elbow but use your wrist. “Explosiveness” all comes from the wrist and the body rotation. We don’t need your forearm and elbow in your serve. Beside the classical tips and tricks, you should also do a “psychology” game. Before doing this “ghost serve”, serve some topspin serves with a clear “up motion”. And then at the crucial points (9-9) or (9-7), use this tricky serve with the same “up motion”. This way, you can easily trick your opponent. “Ghost serve” is a pure underspin serve. This serve is also slow. So a simple “drop shot” can easily return this serve short. That’s why, you should learn how to add “sidespin” to your serve, which will make your serve more dangerous. I’ve shown you 3 tips to do this tricky serve: Hold your racket loosely, Put the elbow close your body, rotate your body, accelerate with your wrist, and add fake “motion” after the contact point. How to make your table tennis serve deceptive: The key point is knowing how to accelerate with your wrist.